This is one of our free cross stitch patterns named Winnie The Pooh (Large), an adorable yet simple pattern that would be a fun choice fit for your kids’ first embroidery project, or other cross stitch project for your loved one. You can also use this cross stitch patterns free download for your upholstery design, pillow cases, bed spreads, and so many more. Disclaimer: “Winnie the Pooh” character and its name the copyright, trademark and property of Disney Corporation and Dutton Children’s Books. All rights reserved. 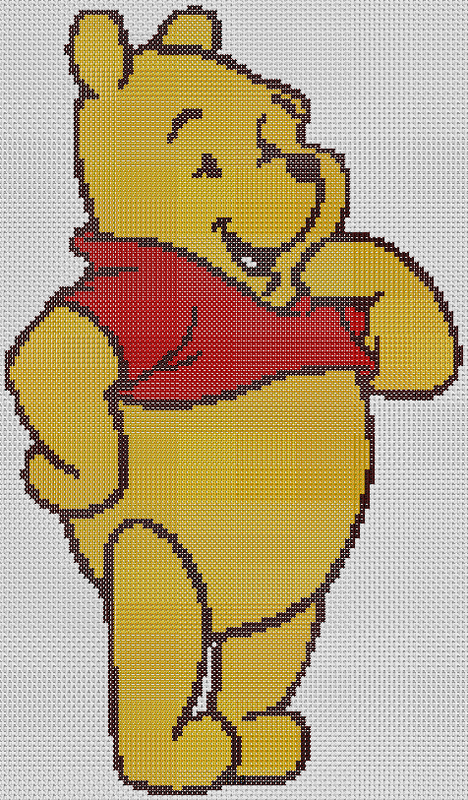 Cross stitch patterns found in this site bearing the Disney and Winnie The Pooh names and images are for personal use only. Download this free cross stitch pattern zipped file (approx. 265kb — downloaded 246 times). The password for this download is “crossstitch4free” without the quotation marks. We do our best to add as many of your favourite free cross stitch patterns available for you to download. All our designs can be easily searched using our Search Form, or you can scroll to the bottom of this page and click on the linked words in the Related Keywords list or the suggested cross stitch charts displayed. Our free cross stitch patterns to print may be simple, but we purposely developed it in such a way so that you can combine them with other cross stitch projects such as our cross stitch alphabets samplers to make the designs unique for yourself. If you would like us to update you on our latest patterns, just subscribe to our updates either via e-mail or RSS feed (link can be found at the bottom of this site), and you will be reminded every time a new design comes along. If you face any problem downloading any of our patterns, or would like to suggest a design, you can reach us via our Contact page and tell us your favorite cross stitch design downloads. We’ll do our best to get the chart up, which of course will be provided for you for free.